Often, businesses require single instance cleaning or one-time cleaning services. Such a cleaning might include any number of tasks and reasons. Single instance services require flexibility to meet client demands. Furthermore, experienced cleaning technicians will make for a smooth project. Single instance cleanings are often short notice requests for janitorial providers. One-time services are provided by some cleaning companies. Some are not. Thus, when you contact a cleaning company, ensure this is a core service provided. Office & Business Moves: Single instance cleanings are needed for office moves both in and out. 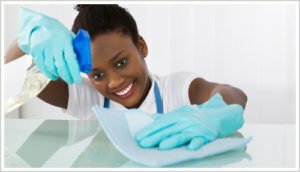 White Glove Cleanings: Offices, medical offices, retail spaces, and the like require deep cleaning services. Retail Store Events: Special events and promotions can prompt single instance cleaning needs. New store openings are another reason. Event Cleaning: Various events from seminars to office parties can prompt one-time cleaning requirements. Compliance Factors: Day care centers, child learning centers, or medical environments often request one-time cleanings for compliance constraints. Construction: New construction or remodeling can prompt one-time cleanings. In addition, nearby construction can cause passive dust and debris that may require a cleanup. Data Centers, Server Rooms, & Technology Closets: Rooms housing technology equipment both small and large require cleaning to protect sensitive equipment. Technology environments often require a regular cleaning schedule. Conversely, one-time cleanings can suffice. Logistics: What are your building access windows? What is your parking availability? How much foot traffic will there be? Are there security constraints? Furthermore, will you need to be present? Space Specifics: Square footage, types of flooring, ceiling height, number of bathrooms and kitchens, quantities of glass and windows, etc. will drive the cleaning proposal. Likewise, fixture types and shelving can be important. Site Visit vs Floor Plan: To build a proper proposal, a site visit may be required. However, well taken pictures along with a floor plan and measurements can be adequate to create your estimate. Tasks: Vacuuming, mopping, stain removal, dusting, sanitizing and disinfecting, trash removal, and like tasks should be discussed and agreed upon. Furthermore, It’s important to describe those tasks that should be avoided. Foreman Pro Cleaning – Single Instance Cleaning Capable! Foreman Pro Cleaning is a full service cleaning company. We provide a full suite of janitorial and commercial cleaning services, including single instance cleaning capabilities. Thus, if you require a single instance cleaning, don’t hesitate to contact us today! We provide cleaning services in MD, VA, and D.C. Our VA region includes the Hampton Roads metro area fielded by our Newport News office. We oversee our MD and D.C. region via our Annapolis office. Regardless of your region, we want to hear from you! Previous Post Is Your Cleaning Company Saving You Time? Next Post Trusted Janitorial Services – Hampton Roads Virginia!